One of the most brilliant decisions of Marvel Now! was attaching artist Esad Ribic to Thor: God Of Thunder. His work captures the scope, power, and fantasy of the Asgardian’s world with a level of raw craft that is hard to find in superhero comics. The influence of Frank Frazetta is heavy in Ribic’s detailed linework, atmospheric shading, and impeccable anatomy, and he blends those elements with the exaggerated dynamism of Jack Kirby for incredible action sequences. Teamed with colorist Ive Svorcina—who earned an Eisner nomination this year for his lush, beautifully textured work on this series—Ribic has made Thor: God Of Thunder one of the industry’s most awe-inspiring reads. Writer Jason Aaron is no slouch on this title, either, and his most recent storyline has taken advantage of Ribic’s strengths to turn up the intensity. 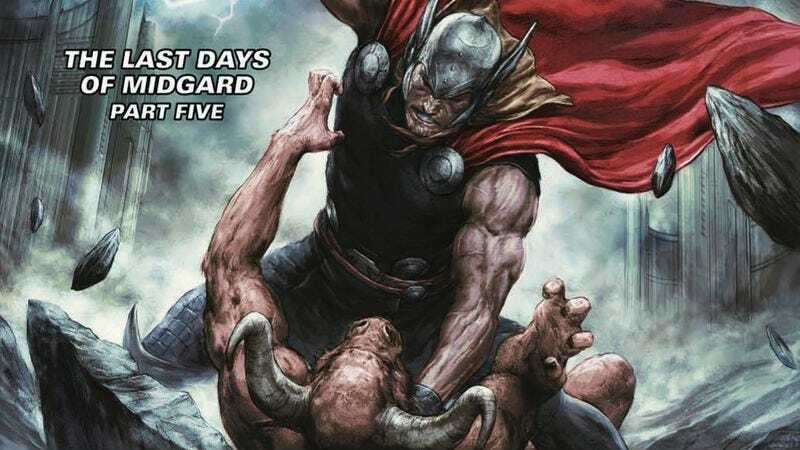 Pitting present-day Thor against an evil corporation run by a devious minotaur, while his future self single-handedly protects the barren Earth from Galactus, the World Eater, “The Last Days Of Midgard” has delivered riveting, white-knuckle action while exploring how Earth’s legal rules get in the way of a god’s righteous anger (not unlike Charles Soule’s current take on the law in She-Hulk). “Last Days” comes to a close with next week’s Thor: God Of Thunder #23, and this exclusive preview shows that readers are in for one amazing showdown in the final chapter. As Thor’s three granddaughters watch from the ground, a severely damaged Galactus is about to come to blows with the King of Asgard, who has bonded with Gorr the God Butcher’s Necrosword to become Necro-Thor. It may sound over-the-top and absurd, but in the hands of this creative team, it’s a spectacular display of artistic expression.